The Classic Series provides upgraded features compared to the MAC series while staying light-weight compared to the High Wall series--the best of both worlds. 823D 12' A 425D clone with exterior cube fridge access in lieu of a bay window--lots of counter space. 625D 12' Flagstaff's only 12' low-wall Classic with an interior shower/cassette toilet. The sofa pulls out to make a fourth bed! 627D 14' Flagstaff's only 14' low-wall Classic. With an interior shower/cassette toilet and an exterior-access fridge! Please note: this page includes all of the low-wall Classic tent campers Flagstaff offers. 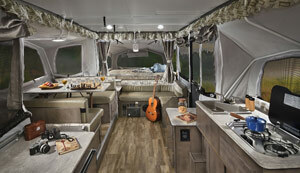 Some models may not be available at our store; please check New Campers In Stock for our current inventory. Thank you! Prices and inventory are subject to change without prior notification. Privacy © 2009-2019 Roberts Sales. All rights reserved.